Rollin' down the river with Proud Mary and her krazy krewe! : Camo and bows? Today we went and had lunch at Pompano Joe's. It was really nice since it's located on the beach. We looked out at the water while we had lunch. The breeze was very nice! They had some "reggae rolls" which was their version of southwest egg rolls. They were good but not as good as Angela's! After we had lunch we cruised a little bit. Clint wanted to go to Bass Pro Shop. Ugh. I wasn't excited about this. However, I sucked it up and went. Let me tell you...NEVER again will I go there. Seriously, I hated it! They had camo onsies with a white ruffle and bow. EWW bows and camouflage? BARF! I was a good sport and sucked it up once! I won't go again unless Noah begs me to go. We headed to the beach again this afternoon. It was amazing! I swear around 5 is the best time to go. The crowds are minimal and the sun is slowly going down. This works out great for Noah since he hates the sun (it hurts his light eyes). 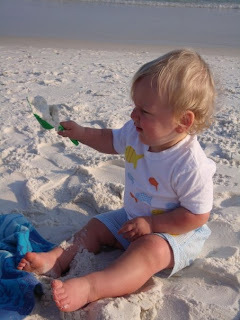 He played with his shovel and burried my feet in the sand. We took him out in the water and he had a blast. He kept on running around in the water, it was adorable. I even took the boogie board out there and caught some waves! It was a lot of fun! I love going late in the day because the sun isn't burning my albino skin. Once we left the beach we decided to take a dip in the pool. Again, Noah was great! I think we need to save outdoor activities till the late afternoon. He is a totally different baby then! MUCH more enjoyable! Tomorrow we are hitting up the outlets! Yahoo!